We’ve had rain, rain and more rain. Four inches in several days’ time. 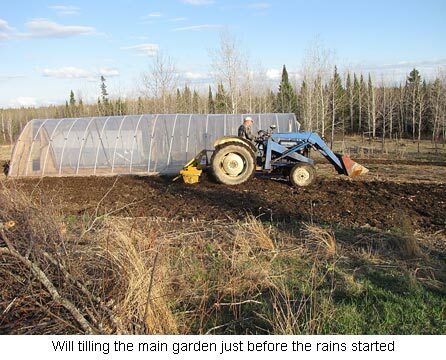 Luckily, Will managed to get our main garden tilled just before the first rain hit. It tilled up very nicely and now I’m itchy to get in and get the onions and peas planted. Our little buck goat is doing great. For a while there it was kind of come and go but suddenly he decided he’d live. We still have him on the bottle as his mom didn’t bond with him. She’s not mean to him but won’t let him nurse. We’ll keep trying. We called him Rocks. His grandfather was our Boer buck, Rocky, and unfortunately this buckling is as dumb as a box of rocks … Real cute, though. 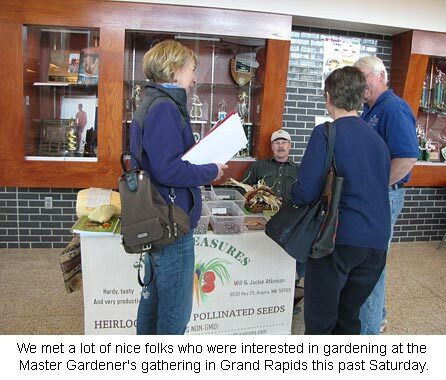 The past weekend, we attended a gathering of Itasca Co. Master Gardeners, bringing a small booth to set up for Seed Treasures, our little seed business. We met a lot of nice people and were so happy to hear so many people concerned with planting only non-GMO seeds! We brought several bins of different beans and colored corn as well as a Hopi Pale Grey squash and some dry corn on the cob (Painted Mountain) which was very colorful. 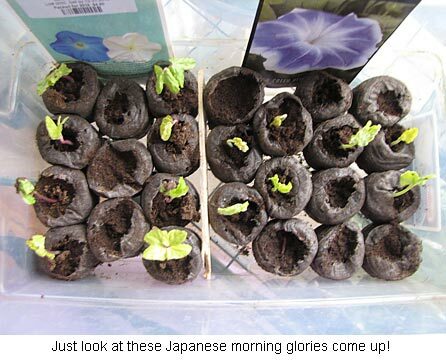 My Japanese morning glories are roaring up. Holy mackerel, you can actually SEE them pop out of the soil like beans do. They were very big seeds and the leaves are huge. I can hardly wait to see the blossoms! I’m starting to transplant tomatoes and, boy, did they germinate great this year. I put two seeds in each peat pellet and many had two plants (or more!) come up. I hate waste so I’m carefully transplanting each one so as not to waste. The extras I’m giving to my friends Diane and Gina to sell at their greenhouse. I don’t need 388 tomatoes! … plus the extras too. We had this in Canada as well. Money was always tight and Mom bought margarine since it was cheaper. Ours came with a capsule of red powder which we had to work into the margarine. Us kids were intrigued by the powder but no one wanted to work it into the block of margarine. Somehow that red powder always made it all over the kitchen which meant the one stuck with the task also had kitchen clean up duty. Jackie, some of my favorite childhood memories were of our family vacations to Spider Lake outside of Grand Rapids. It took 2 days to get there by car, but when we spilled out of the car on arrival the joy was unsurpassing. We shopped for groceries in Grand Rapids on our way in, and the 3 of us children fussed over who got to massage that red dot on the butter package (it made Minnesota seem exotic, strange, and wonderful ~ which it is). A stop for moccasins was also part of our arrival itinerary too. Thanks for evoking such wonderful memories today.